Freebie Elf Stitchette Embroidery Patterns! I gave the ever popular redwork a try on these. I really like using a lot of colors when I embroider but I worked on these over Thanksgiving at my parents’ house so it was super easy to just bring one color of floss. I think they look really cute in all red. We got our snow last night. Hurray! We’ve already been outside once this morning and now Oscar has pulled his rocking chair over to the front door, parked himself and firmly announced that he’s waiting there til we go outside again. Poor Mom better layer up this time. Yay! Thank you so much for sharing these, Hillary! 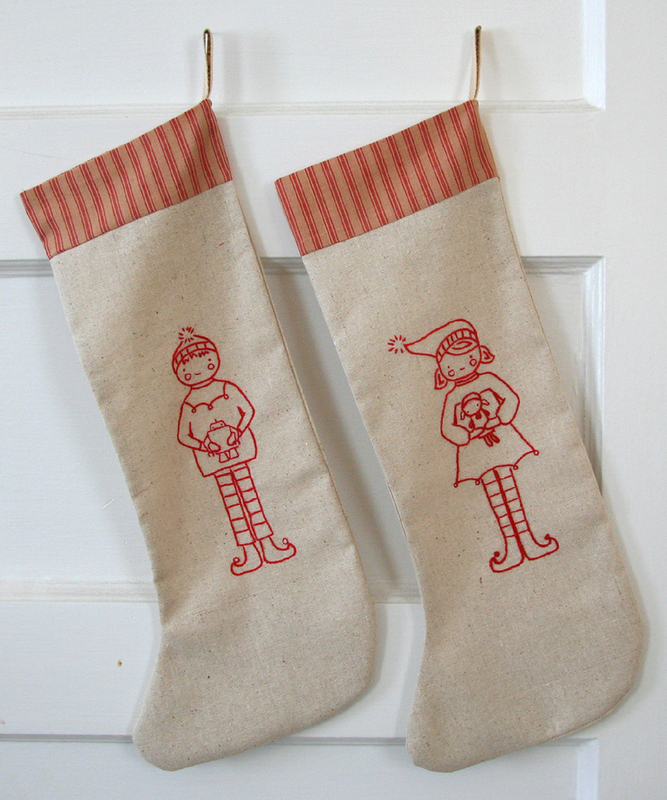 When I first peeked them, I thought it would be perfect on a stocking for my little one, and now I see that they DO look just perfect on a stocking! Beautiful work! Now go enjoy that SNOW! aww so sweet! when mine were little they would only come in to get warmed up for 5- 10 minutes and dry mittens then go right back out again. with 4 of them i had an assembly line of mittens in varous stages of drying all day! Thank you Hillary! They are SOOOO cute! I am so excited for these! I came by here specifically today to see if you had any news on them and here they are, yippee! As if my Christmas craft list wasn’t long enough! Thanks a bunch, they’re very cute. as soon as i get a transfer pencil i will be stitching these away. does one need to use transfer paper as well? nope, one or the other transfer paper or transfer pencil. I use the pencil. Yes, Virginia there is a Santa Clause! Thank you Hillary. I love them! I have no time to make anything more, but these are so cute I just have to! I like the dishtowel idea, Jenn. I LOVE them!!!! Thank you, thank you, thank you!!!!!!!! merry christmas indeed! thank you for sharing hillary. bundle up! Very cute elves! I love them on the stockings. Thank you so much Hillary! I love them! Those stockings are so cute! Wow, I was going to sew my daughter a new stocking with a giant olde english initial on it, but I think I’ll do the little girl elf instead. Anyone have font suggestions for doing the name? Thank you Hillary! I can’t wait to start!! these are so sweet. you are quite generous… thank you. Oh my, they are too precious. THANK YOU for sharing them with us! I love the redwork on these patterns, way to go! thanks, these are great! love them on the stockings. and i can’t believe you have snow. it’s so hot + humid here i want to turn the a/c on, but a/c in december??? Thanks for sharing this Hillary they’re adorable. Thank you THANK YOU miss hillary..this is a wonderful gift you have given! Thanks so much for these cute patterns…love the little robot and doll each elf is holding! Wow a girl and a boy, you are so generous, thank you. These are adorable Hillary. I think they may be my favorite, although I’m under the spell of Christmas right now so ask me again after New Year’s. p.s. I’m also into elves now and making some myself (the 3-d kind), so you’re freebie is perfect timing! Thank you so much! I love redwork! Your kindness is appreciated. oh, they are just too good! that robot is killing me! Thank you Hilary! You’ve given me the shove I needed to try embroidering a try. My secret fear is that it looks really easy, but will be really hard. I see these on some holiday-themed dishtowels. Well, off to buy linen 😉 Thanks again! oh those are great…if i have time they may become holiay napkins! super cute! (The patterns and Oscar waiting to go back out in the snow)Love the robbot in boy elfs arms. great detail! It’s such a nice gift. May I add my thanks for the pattern also. They are delightful!!!! They look awesome – wonder if they’d look as good if I used permanent marker – just kidding! Thanks for sharing, Hilary! They are too cute. Snow? I wish snow. I live in Atlanta and it’s a rare commodity around here, but hey when we do get snow everything shuts down so we get to enjoy it at least. Enjoy your snow and thanks for the elfin freebies! They are really cuties! Thank you! What a lovely gift. These are so great, Hillary! Thank you very much. Our snow is lovely, but we didn’t get nearly as much in the city as I anticipated. Today we’re going ice skating to celebrate the new snow. Thank yo for sharing them with us. They are abosolutely adorable. I can’t wait to stitch them – though not sure which Christmas they will be ready for!!?? I love these elves! Thank you so much for sharing them. Thank you so much for the patterns–they are perfect! These are fab! I’ve already made 2 girls during our blizzard yesterday. Doing them in red is brilliant! I’m off to the fabric store for some better backing to embroider on. Thanks for the free pattern! All good karma will come yor way for the holidays. Thank You! You rock! These are adorable and I love it that they’re holding your doll and robot. Excellent designs! Thanks for the gift! Thank you. They are beautiful…and they will make a perect matching set for my perfect matching set! How exciting. Thanks very much. These are so wonderful,thank you!! Now, I just need to go find a transfer pencil! 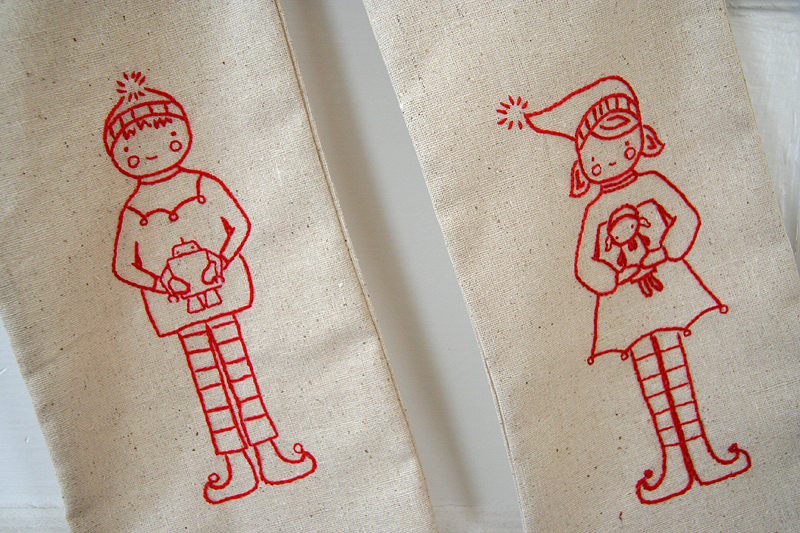 Fab elves and they look so perfect in redwork on those stockings. May have to lay down the knitting needles and get busy with the embroidery points. Thanks so much for sharing these. Thank you so much for this freebie, I can’t wait to give these a try! Thank you for these wonderful embroidery patterns! I love these! Thank you so much for this Christmas present! Happy Holidays! Thank you for more Christmas gorgeousness. Yay, thanks so much for these, they are so lovely. I fear i will have to wait until next year to make them though – so many projects, so little time! These are adorable, and I love that they are all red. I remember seeing a needle felted squirrel on someone’s blog (I think) sometime in the last 6 months or so. I can’t find it now and it’s driving me crazy! It was all brown and really plain and natural looking. It’s not the fibertrends one. If that sounds familiar to anyone can you comment back to help jog my memory? Thank you! I can’t wait to try them. Love ’em – thank you! For a completely different look, wouldn’t these be pretty done on a red velvet stocking! THANK YOU SO MUCH !!!!!!!!!!!! thanks! so very good! and I love the all red (duh.) and the little toys and shoes are such a nice touch! Too cute!! Thanks for sharing these!! It looks really nice and makes me want to learn how to stitch properly! Thanks again! I love them! oh my GOD. those are so adorable. great work!! thank you so much for sharing the cuteness. i cant wait to give them a try. thank you, thank you! I can’t wait to make these. It’s fun to think of all the different variations of these that will be in blogging households everywhere, thanks to your generosity and creativity! thank you so much for this sweet surprise. these would look great on some cotton kitchen towels – for display only! they take me back to the days when i learned to skate. thank you for jogging good memories, hillary. p.s. – stay warm. my friend in chicagoland called to say it was 10 degrees earlier this evening. Thank you so much for the treat! I had to try something a little different with it. You can take a look over on my new blog, http://thimble-ishus.blogspot.com . I will wear it with pure holiday joy. Thanks again. Hillary, I just retired and now I am sewing and embroidering and being creative again! Thank you for sharing this wonderful design, I love it!